The Nyungwe Forest National Park, in the southwest corner of Rwanda, is a vast untouched tropical rainforest, with a high dense canopy. This rainforest is magnificent, not only because of the wildlife that lives within , but also because of the variety of Mahogony trees that tower above. Here in the park, these huge tall old mahoganies, ebonies and giant tree ferns are like skyscrapers, hovering over one; at the same time there are orchids and other epiphytes clinging to the branches. In addition to the flora and fauna, Nyungwe Forest is renowned for the variety of primates (25% of Africa’s total) that co-exist with the over 300 brightly coloured bird species and hundreds of different butterflies everywhere. To get a real sense of the magnitude of the forest, one can walk the 50 meter metal suspension bridge that has been built above the canopy; truly an unforgettable experience. Activities in Nyungwe Forest National Park are for the active trekkers. 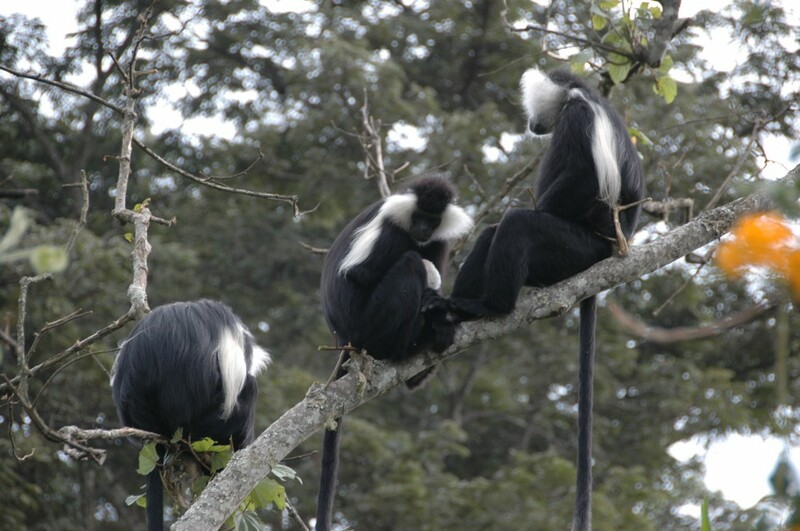 There are many options available, the most popular being the Chimpanzee Trek; but other primates are there to be sought, such as the grey-cheeked Mangabey and Rwenzori Colobus monkeys. Forest hiking trails are available; a total of 130 kilometers have been created. The trails last from 1 to 8 hours the Igishigishigi Trail is one of the shortest, includes the canopy walk with spectacular aerial views of the Nyungwe Forest.